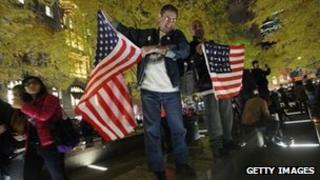 A New York court has ruled that a pre-dawn clearance of the Occupy Wall Street camp at Zuccotti Park was legal. Hundreds of protesters returned to the park as night fell on Tuesday, but they will now not be allowed to pitch tents or use generators in the plaza. Police arrested some 200 people in a surprise pre-dawn raid and later detained several journalists. New York Mayor Michael Bloomberg said the move was prompted by public health and safety concerns. The court ruling came at dusk in New York, with hundreds of protesters still gathered around the barricades at Zuccotti Park. Around 17:30 local time (22:30 GMT), protesters were allowed back into the park, in single file. Protesters began discussing new plans and the mood remained positive, according to a BBC reporter at the park. Drummers and guitarists kept playing and some gathered at a junction with nearby Broadway. Organisers handed out ponchos as rain began to fall, but there was no immediate sense of a concerted plan, our reporter said. Daniel Klein shows me his bruised face and his broken ribs - a casualty, he said, of last night's eviction of Zuccotti Park by the NYPD. Daniel is back, and intends to stay in the park overnight, somehow - though he can't sleep here. A few people sit on the stone benches, wearing space blankets. That seems permissible under the new rules - no sleeping bags, no lying down. Some protesters intend to spend the night in local churches, others in the houses of supporters. Chris and Mike, brothers who work for a football charity, say it makes no difference to the movement whether people can camp here or not. "Things are bad and they're not getting any better," says Chris. The nightly general assembly discusses the possibility of moving to a different location in Manhattan. The police stand watchfully by, as newly hired burly security guards monitor comings and goings in the newly cleaned park. Police said there was no official curfew, but that protesters would not be allowed to sleep at the park. Protesters with backpacks and large bags were not allowed inside. "Whatever the ruling, we have the right to protest. This is our city. This has been our home for two months. The whole world is waiting to see what is happening here," one protester told the BBC. At the New York Supreme Court, Justice Michael Stallman denied a motion brought by lawyers for the protesters, saying that rights guaranteed under the first amendment to the US constitution do not entitle them to camp out indefinitely in the plaza. His judgment allows continued demonstrations, but prevents "tents, structures, generators and other installations". Mr Stallman said the protesters had not "demonstrated that the rules adopted by the owners of the property... are not reasonable time, place, and manner restrictions permitted under the First Amendment". Speaking after the judgement, New York's mayor said the rights of non-protesters were as important as the rights of those wanting to stay in the park. "The court's ruling vindicates our position that First Amendment rights do not include the right to endanger the public or infringe on the rights of others by taking over a public space with tents and tarps," Michael Bloomberg said in a statement. This is where it all started. A global movement opposed to corporate greed, the political power of big business and what the protesters see as the injustice of inequality. But is this where it all ends, too? White House spokesman Jay Carney told reporters on board Air Force One that the Obama administration believes local city governments must each make their own decision on how to deal with protesters, the Associated Press reported. A number of other US protest camps have also been cleared in recent days. Police arrested dozens of people in Oakland, California as they closed the protest camp in the centre of that city on Monday morning. There was a fatal shooting near the camp last week and Oakland Mayor Jean Quan said she had to evict the demonstrators "before someone else got hurt". Since the weekend, police have also closed solidarity protest camps in Portland, Oregon; Burlington, Vermont; Denver, Colorado; Salt Lake City, Utah; and St Louis, Missouri. Tuesday's operation, launched at about 01:00 (06:00 GMT), swept most of the demonstrators out within an hour. Media captionPaul Browne, NYPD: ''It was done in a very even-handed and restrained way"
As a helicopter circled above, clean-up crews worked through the night clearing away piles of rubbish. Dozens attempted to resist arrest by linking arms or chaining themselves together with bicycle locks. "I was bleeding profusely. They shoved a lot of people's faces into the ground," protester Max Luisdaniel Santos, 31, told the Associated Press news agency. Protesters also assembled at nearby Foley Square, and posted updates from there to a new Twitter account. Some also tried to occupy Duarte Square, but were thwarted by police, who made several arrests. Small-business owners had complained about the noise and unsanitary conditions in Zuccotti Park, accusing demonstrators of messing up their toilet facilities and driving away customers.